The economic downturn of the last years has led to a crisis in the Dutch building and construction sector, as well as in architecture. Many architecture firms have seen their revenues shrink, having to fire employees in their struggle to survive. As a result, young architects and urban designers are starting their own enterprises – the last years have seen a strong increase in the number of architecture offices. Reactivate! explores how these new firms work differently and how they deal with the new economic and societal challenges. Van ‘t Klooster has visited and interviewed a number of these companies in order to get a grip on the new generation of architects and urban designers in the Netherlands. Reactivate! 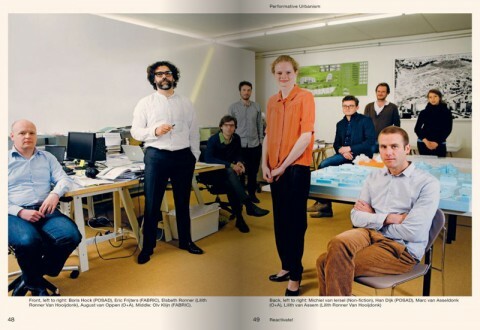 features some forty young architects and their work. According to the author, this acclaimed, self-conscious ‘post-starchitect’ generation is characterized by social engagement and a strong urge to explore the borders of their profession. It has become normal for most of them to set up co-ops, manage complex processes, and take the initiative for projects themselves, rather than wait for new clients. The role of the architect has changed from producing buildings to programming and agenda-setting. Crowd-funding has helped building the Luchtsingel in Rotterdam. Reactivate! builds upon three main ideas that are crucial to the new city-making discourse: (1) a strong focus on coalitions and partnerships, (2) on urban strategies instead of designs, and (3) on unsolicited proposals. The new Dutch architecture generation is portrayed based on nine ‘statements’, such as ‘Performative Urbanism’, ‘The Amateur Is the New Professional’, ‘DIY Architect’ and ‘Testsite NL’. Every statement presents a selection of theme-specific agencies and their projects. Here it’s not only about buildings, landscapes and other types of spaces – also apps, new types of city-making processes and financing models are considered ‘architecture’. The internationally acclaimed Luchtsingel project by ZUS features in Reactivate! 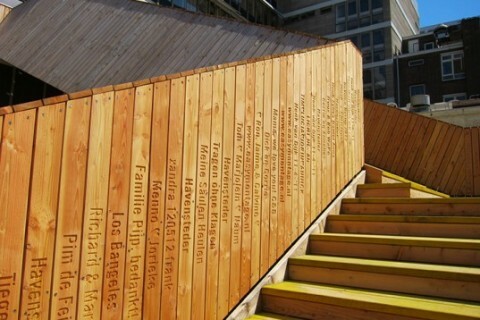 mainly for its financial model – a substantial part of this suspended public space in Rotterdam was crowd-funded by local citizens. Another interesting example is Non-Fiction’s FloriadeRadar, a project in Amsterdam that aims to turn social media activity into a tool for city-making. Then there’s a nice selection of successful ‘soft’ and strategy-oriented urban regeneration projects, such as WIJkonomie Tarwewijk in Rotterdam and Amsterdam’s Heesterveld Community. Characteristic in these projects is the widely acclaimed bottom-up and DIY perspective on city-making. Reactivate! also features offices and projects that are less ground-breaking in my opinion, especially the numerous Superdutch-inspired buildings and landscape designs. Okay, they’re carbon-neutral and stuff, but what’s more? This calls to question: what is the selection of offices in this book really based on? Tirana? Amsterdam! 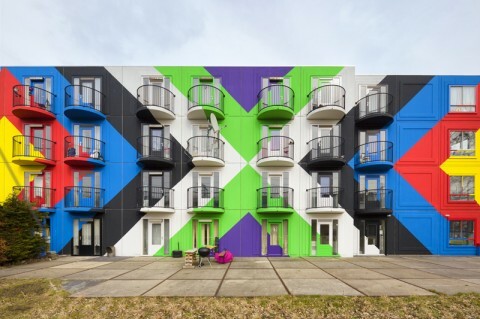 Heesterveld Community facade design by Floor Wesseling. Photo courtesy of Ronald Tilleman. All in all, Reactivate! does a pretty nice job in documenting a new emerging wave in architecture and urbanism in the Netherlands. However, aren’t we just talking ‘crisis architecture’ here? According to Van ‘t Klooster the trend had its birth around 2006, two years before the start of the economic crisis. Still, it’s been the miserable economic situation that has forced many young architects to start their own offices. It’s definitely not a choice based on wealth and luxury. Will ’unsolicited proposals’, DIY and the focus on small scale also stand the test of better economic times? On Saturday 8 June the threefold exhibition ‘Radical Locality; Actual Potential’ was opened at Bureau Europa in Maastricht’s Timmerfabriek. With ‘Radical Locality’ Bureau Europa conducts from 8 June through 5 August research into the meaning of the local and the role of architecture in our globalizing world. In the main exhibition room, Bureau Europa presents a group exhibition around Reactivate!.